One of the most beautiful place in Mexico is hidden beach, Mexico has over 5100 miles of coastline and of course, it is not made up of popular resorts areas like the Riviera Maya, Mexico's top beach destinations certainly do offer some delightful scenes however the nation's less visited coastlines remunerate the adventurers that search them out. 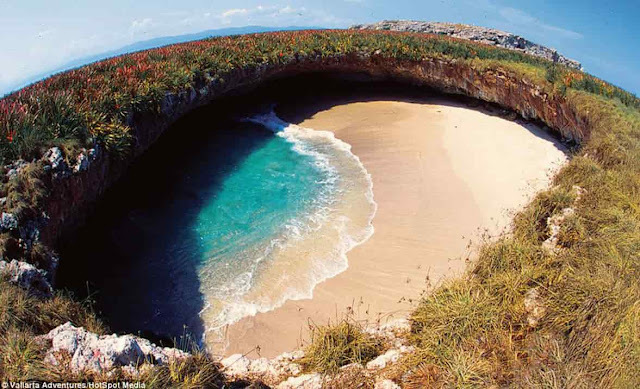 Mexico an awesome hidden beach that is completely invisible from the outside. who doesn't love small isolated with white sand and crystal clear water? Arial view of Hidden Beach. photo by Vallarta Adventures/Hot Spot Media. well, this is one of the best ones, in Marietas Island in Mexico, there is an amazing Hidden Beach that's completely invisible from the outside and you can only get there by swimming into a cave or by helicopter. The beach is basically a hole in rockery marietas Island which has been created by the bombings of the Mexican military in 1900's, because marietas Island was completely uninhabited, they were an ideal state for the Mexican government to test their weapons and heavy artillery. this led to the creation of many Caves and now famous hidden beach Playa Del Amor ( the beach of love) or in simple words Playa Escondido ( the Hidden Beach). in the 1960s, the bombing stopped allowing the Island to recover its natural beauty, and made it one of the most beautiful places in the world, in 2005 they were named a National Park. They are basically two ways to reach Marietas Island either swimming into the Cave or take a helicopter ride that will drop you right into it. you can also do that by first visiting the popular Puerto Vallarta or for a match shorter ride, the Punta de Mita. You can also take a tour boat or a small fishing boat. with a boat, it will take you about an hour from Puerto Vallarta and 15 minutes from Punta De Mita, the boat will drop you in front of the cave. just swing into the cave and you've reached the Hidden Beach. The beach is a wonderful isolated place in low season, but if you happen to go there during high season expect a lot of tourists. A gaping hole in the surface of the lush green Island opens onto a secret beach with ample shade, sun, and crystal clear water. it looks like something out of the Fantastic novel, wide Sandy cave with blue waters of the Pacific running in. The Marietas Island is formed by underwater volcano eruptions. they are Natural wonders, but it was something brought the buried beach to light. In the 1960s, scientist Jacques Costeau led a protest against harmful human activity on the island, and finalize name it a national park, Parque Nacional Islas Marietas making swimming, Sun boating and other forms of reactions the only activity and prohibiting hunting and fishing Around The Island. Later on, the park was designated as a UNESCO MAB Biosphere reserve. extensive military testing damaged Flora and Fauna on the Island for decades. but many years of peace have replenished the island pristine water and marine life. It is only accessible through a long water tunnel that links the beach of the Pacific Ocean. There is approximately six feet of space above water level. so, the visitor can arrive at the Beach by swimming. the island remains uninhabited but frequently visited by a tourist who comes to enjoy that divers Marine wildlife and the unique tropical Eden of Playa Del Amor. There are ample tour companies that provide day excursions to the Hidden Beach. also, wristbands on the Hidden Beach are limited and must be reserved a few days in advance.